Illinois is known nationally for its political corruption. Now it’s earning another dubious distinction – the high cost to win public office. Recently released campaign disclosure reports confirm what observers long expected: the Illinois governor’s race broke the record for the most expensive gubernatorial race previously set by California, a state with three times the population. Year-end reports were due in to the state late Tuesday for all candidates running for office in Illinois, shedding light on who pays for campaigns and how the money is spent. The reports also show that following the mega-bucks governor’s race, the frenzied mayoral race in Chicago is playing out as a story of haves and have-nots. Even though Chicago voters have more than a dozen mayoral candidates to choose from, many in the field are struggling to convince powerful interests to supply the cash needed to get their message out. In the contest to lead the nation’s third largest city, 14 candidates have secured spots in the race and one is fending off challenges to his petitions to get on the ballot. The open-seat election is Feb. 26. But if no candidate receives a majority, the top two vote-getters will enter a runoff on April 2. A strong mayoral campaign is likely to need millions of dollars to pay for advertising in the pricey Chicago media market and field a campaign staff that can work for votes across all 50 wards. So as the politicians vie for attention from average voters, they are also competing less publicly over the wallets of big campaign donors. Seven candidates have cracked the $1 million mark in fundraising so far, some just barely. And most of those leading this behind-the-scenes battle have a long history working the fundraising circuit. Many are already up with TV ads. 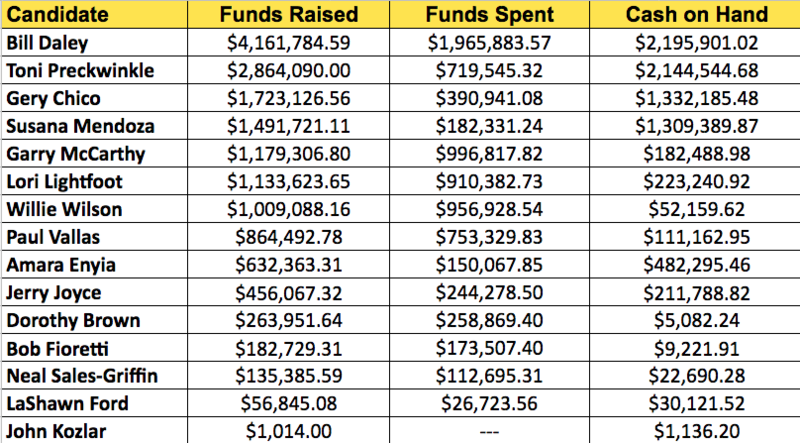 Mayoral candidate fundraising totals as of January 17, 2019. For now, Bill Daley appears to be leading the cash dash, reporting raising nearly $4.2 million, a hefty $500,000 of which he gave himself, and almost $2 million of which he has already spent. Daley is not just a member of a political family that has dominated Chicago politics for generations. He also has deep business sector ties, having previously served as a JPMorgan Chase executive in addition to being President Bill Clinton’s commerce secretary and President Barack Obama’s chief of staff. Among Daley’s largest donors are private equity and insurance magnates. He also received $275,000 from executives tied to one of the largest beverage distributors in the country, Reyes Holdings LLC. Toni Preckwinkle was first elected as an alderman in 1991 and recently secured her third term as Cook County board president, where she has a large say in tens of millions of dollars in contracts and union agreements. To date, she has raised close to $2.9 million in her mayoral run, with approximately $2 million of that total coming from branches of the extensive Service Employees International Union network and $100,000 coming from philanthropist Fred Eychaner. Preckwinkle has spent over $700,000 so far. Former Chicago Public Schools President Gery Chico, who lost a 2011 mayoral bid, has reported raising about $1.7 million in this election cycle, of which he’s spent about $391,000. The longtime attorney and lobbyist has also held leadership posts at the city’s park district and the state board of education. Like Daley, Chico provided starter money for his campaign, though his $29,000 pales in comparison to Daley’s $500,000 contribution to his own coffers. Susana Mendoza was first elected to the state House in 2000, later elected City Clerk and was recently re-elected state comptroller, where she controls state bill payments. In her mayoral run, Mendoza has raised almost $1.5 million so far. Some of her biggest checks include $250,000 from the LIUNA Chicago Laborers’ District Council – the same amount LIUNA had given Rahm Emanuel a few months earlier – and $100,000 from Howard Labkon, part owner of a city scrap yard. Mendoza used $500,000 from her state comptroller account as seed money for her mayoral race. The race also has a notable self-funder: Willie Wilson, an entrepreneur who made his wealth from McDonald’s franchises, a medical supply company and other businesses. Last year, Wilson put enough of his own money into the race to trigger a law that eliminated all caps on contributions to any candidate. Wilson has so far reported chipping in just under $1 million of his own money on his second race for mayor, with other donations putting him at just over a million dollars total. Wilson has burned through his money, spending $956,842 as of this past quarter. Former Chicago Police Board President Lori Lightfoot has raised over $1.1 million in her race, while former Chicago Police Chief Garry McCarthy has garnered almost $1.2 million. Chicago Public Schools CEO Paul Vallas reported raising $864,493 since beginning his mayoral candidacy. Vallas’s biggest contributors are his brother Dean and Koch Foods President Joseph Grendys. Lightfoot, an ex-federal prosecutor, contributed $66,500 to her own campaign and has generated nearly $100,000 from associates at her former law firm, Mayer Brown LLP. And McCarthy’s largest single donor is his campaign chairman, Brian McCormack, a printing business owner who contributed $90,000. Amara Enyia, a policy consultant, has been able to lean on two wealthy music stars to finance her campaign. On Tuesday she reported receiving a $400,000 donation from Chance the Rapper. In total, she has reported raising over $630,000, with Kanye West contributing $200,000 of that. Behind the top cash-generating candidates, six contenders appear to be having a harder time racking up big donations with 40 days left until the election. Coming in at $500,000 or below are Jerry Joyce Jr., a Beverly area attorney whose family has long been involved in city politics; Neal Sales-Griffin, a college teacher and CEO of a nonprofit that teaches children to code; State Rep. La Shawn Ford, a real estate broker and former CPS teacher; former Alderman Bob Fioretti, and Attorney John Kozlar, a former aldermanic candidate. Sales-Griffin continues to fight legal challenges to his petitions to get on the ballot. The expansive mayoral race comes after voters were inundated by an onslaught of TV, radio and internet ads fueled by a megamillion dollar race for governor. Incumbent Republican Bruce Rauner is believed to be worth several hundred million dollars – he reported earning $188 million in 2015 alone. But Pritzker is a billionaire heir to the Hyatt Hotel fortune. Both candidates largely funded their own campaigns, with Pritzker easily trouncing California gubernatorial candidate and former eBay CEO Meg Whitman’s self-funding record. Pritzker contributed $171.5 million to his own campaign last year, while Whitman gave herself $144 million in her 2010 governor’s race. 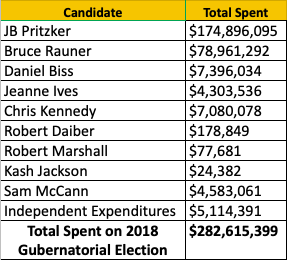 With the final numbers in, Pritzker appears to have outspent Rauner more than 2-to-1. Pritzker spent almost $175 million, while Rauner spent just under $79 million. Counting independent, third party, and primary competitors, the race cost a total of $282,615,399, sliding by the previous most expensive state contest in the country’s recent history: the $279,825,044 race for governor in the much larger state of California. The big money in the governor’s race spilled down-ballot into the contest for attorney general, the state’s top legal officer. Democrat Kwame Raoul outraised Republican Erika Harold by more than 2-to-1, with the Chicago state senator bringing in almost $14 million to the downstate attorney’s $6 million. Raoul won and was sworn in Monday to replace outgoing Attorney General Lisa Madigan. Raoul had considerable help from unions and party leaders. Pritzker’s campaign contributed nearly $3 million while House Speaker Michael Madigan contributed $1 million and the Democratic Party of Illinois fund that he controls chipped in nearly $1.5 million. Likewise, Harold received $1.8 million from Rauner’s campaign and another $1.7 million from billionaire hedge fund founder Kenneth Griffin, a Rauner backer. Whether last year’s millionaire-fueled elections were a temporary aberration or the beginning of a long term trend, the fundraising race in Chicago’s mayoral campaigns shows that personal wealth – or access to those who have it – continues to play an outsized role in Illinois politics. Reform for Illinois will keep shining a light on the inner workings of our government and advocating for common-sense campaign finance reforms to ensure that everyone – not just the wealthy or well-connected – has a voice. *This article was updated January 24, 2019.